How do I pronounce Kyuquot? Where do the kayaking trips take place - Where is Kyuquot Sound? Are the Base Camp Tours OK for kids? How young can they be? How many guests in a Base Camp/Expedition group? I’ve never kayaked before/I'm new to kayaking, are your trips out of my league? It’s been a while since I’ve been kayaking, will I be OK? I’m a more experienced kayaker – will I be on a trip with people new to kayaking and feel held back? How much paddling do you do each day? Do you provide all of the meals? I can't or don’t eat x, y or z – should I bring my own food? Can I charge my camera battery? What amenities does the "off-grid" Base Camp have? Is there WiFi - cell phone coverage? What gear do I need to bring – do you provide everything? When is the best time of the summer to go out there? What is the west coast - Kyuquot Sound climate like? Q: How do I pronounce Kyuquot? 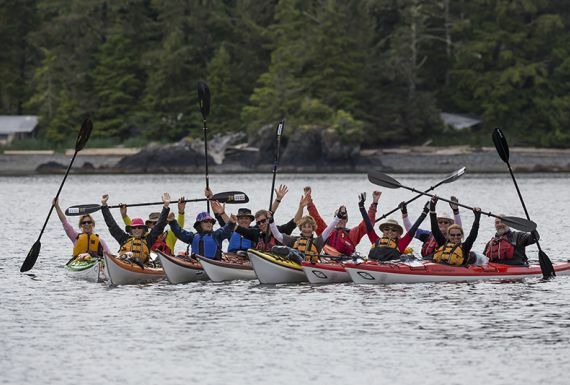 Q: Where do the kayaking trips take place - Where is Kyuquot Sound? You are not alone in wondering this. 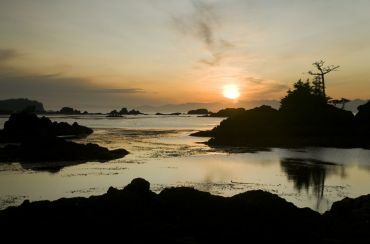 "Kyuquot" is often easily confused with better known "Clayoquot" (the waters surrounding Tofino) but lies approximately 160 km further "up" the coast, on the northeastern coast of Vancouver Island, BC, Canada. Getting there is part of the adventure and keeps the location truly off the beaten path. Our trip packages help to make this easy by including return overland travel from either Campbell River or the Comox Valley on Vancouver Island’s east coast. Both communities have airports that are easily accessed from international locations, and are great bases for other outdoor activities in the area including wine tours, whale and grizzly bear viewing excursions, and exceptional trail networks for walking, hiking and mountain biking. In the early morning of your trip start date, you'll be met at your accommodation of choice, then travel overland across the central mountains on Vancouver Island to the west coast. You’ll then transfer to a water taxi for a scenic one-hour boat ride to our remote base camp on Spring Island, located on the outer edge of the Mission Group archipelago of islands; this is a stunning journey in itself. Simply get yourself to Campbell River or the Comox Valley, and we'll take care of the rest! Q: Are the Base Camp Tours OK for kids? How young can they be? This will vary for each child-parent combo! We’ve had newborns and toddlers enjoy our Base Camp setting and nearby kayak outings. It certainly helps when parents are otherwise familiar with and comfortable with camping and wilderness settings. That said, our base camp infrastructure offers many appreciated camping comforts, including beds, prepared meals, a shower, and space to roam without crashing waves, or history of bears and cougars in the camp area. We can modify each day’s activities to suit each family, including the option of just doing “nothing” which could include a magical day of shoreline play, arts & crafts, games, and playing in kayaks close to camp! Kids love to swim and mess about in kayaks (flipping them, climbing back in, paddling on their own) right in front of our camp. Multiple supervisors, warm drinks and shower are close at hand. Sometimes one or more parent and one or more child might go out kayaking or hiking for the day, while other members choose to read a book or stay in camp. Ditto for seniors – for matriarchs and patriarchs…or relatives who want to be a part of the experience! Our fleet of single and double kayaks includes smaller double kayaks that work well as a parent child combo (5+ years old…which has more to do with size and inclination than age! ), and “triple” kayaks where the centre hatch becomes a seat for toddlers and younger children. Add some snacks, a fleece blanket, a small paddle or piece of wood to tow, and shorter outings to shell-laden islets, and it’s usually a recipe for success. If the weather or sea conditions don’t seem suitable, there is plenty to do on Spring Island and within our camp area. We want guests to feel comfortable on the water, so chose routes and conditions that make this a positive experience. Q: How many people in a group? We meet and exceed industry standards for guide to guest ratios, which allows us to offer a more personalized experience. Base Camp tours usually have of a maximum of 10 people, led by 2 guides (one Lead and one Assistant Guide), which is a 5:1 ratio. In some circumstances (such as a private booking), we can cater to larger groups, by having additional guides join this group to maintain the appropriate ratios. Expedition trips are capped at 8 people, with a ratio of 1 guide to 4 guests. Q: I’ve never kayaked before, are your trips out of my league? Base Camp tours are ideal for people new to kayaking/camping, and we often have a mix of novice and experienced paddlers. These tours offer unmatched flexibility for meeting everyone's paddling interests and experience. The base camp location is ideally situated within a sheltered bay for learning new skills, with nearby island clusters that are perfect for exploring while you become familiar or reacquainted with being in a kayak. Our guides always take the time to assess whether to begin with the basics or offer coaching that refreshes and furthers your paddling skills. We cater to everyone’s needs and interests – keeping it comfortable and enjoyable for all. Expedition trips are designed for more experienced kayakers - people who have done some basic kayak training and touring previously. These tours are not for first-timers or someone not yet sure that they are comfortable in a kayak. If you have previous experience, and you're feeling nervous about your paddling skills or abilities on the water, we recommend taking a short clinic or refresher course before arriving, to help boost your confidence, but this isn't a requirement. Our guides also enjoy instructing, and are happy to work with you to further develop skills. Q: It’s been a while since I’ve been kayaking, will I be OK? As described above, our guides and location are perfect for getting back into it and learning some new skills. We make our daily route and activity decisions based on what each person and the group is ready for. From our Wilderness Retreat Base Camp, we have a lot of flexibility for learning progressions or refreshing skills. As for Expedition trips, any refresher courses taken prior to joining us will help prepare you physically and mentally for multi-day touring in west coast conditions. 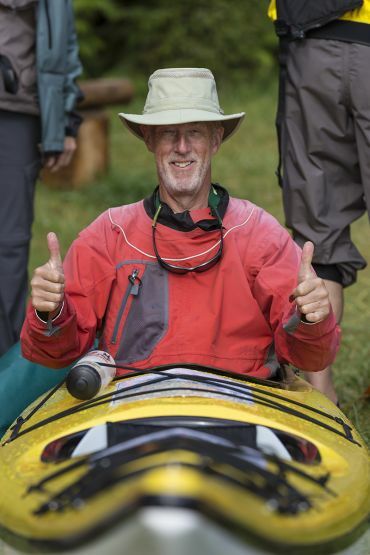 Q: I’m more experienced – will I be on a trip with people new to kayaking and feel held back? 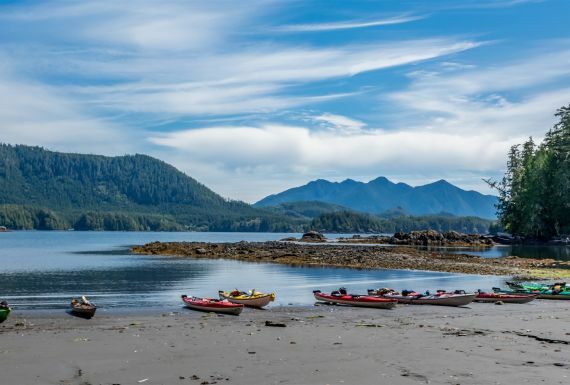 Base Camp tours offer unmatched flexibility for meeting everyone’s paddling interests and experience – we’re on the doorstep of spectacular sheltered and exposed west coast paddling. Our guides always do their best to ensure you feel stimulated and challenged. During daily outings, there will often be an option to paddle longer in more challenging conditions, depending on what different people are after. Expedition trips are geared toward people who already know they are comfortable and prepared for kayaking slightly longer days and in potentially more exposed conditions. We’re never trying to “bag miles” though – there’s way too much beauty to experience and explore. 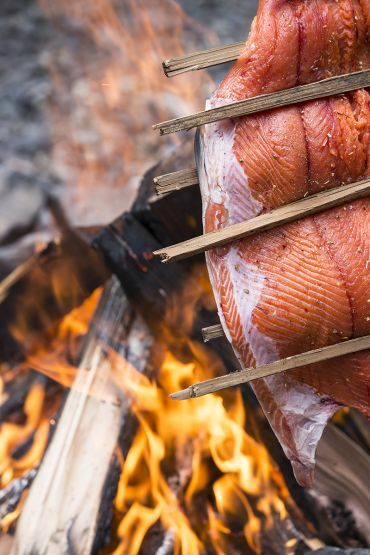 Those with energy to burn can paddle in circles, fish, gather firewood, clean dishes, and practice their roll. Q: How much paddling do you do each day? Base Camp tours usually involve day trips with 1.5-2.5 h of kayaking (with a break) before and after lunch, so essentially 3-5 hours of paddling per day. Expedition trips often involve 2-3 h of kayaking (with breaks) before and after lunch, so approximately 4-6 hours of paddling per day. Meanwhile, some days are better suited to shore-based intertidal, beach, or forest exploring on foot, and other days are better suited to early starts and longer mornings on the water, or sleeping in with more of a focus on bona fide rest and relaxation. We listen to individual and group needs, assess the weather, anticipate likely outings and travel for subsequent days, and inevitably reach sensible decisions that sometimes involve a mixed recipe that satisfies different interests. Q: Do you provide all of the meals? 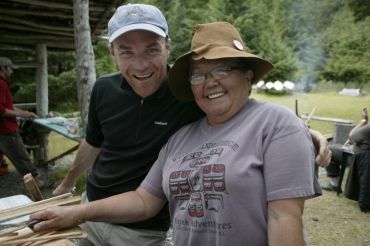 Yes, we provide all the meals, once you arrive at our Wilderness Retreat on Spring Island, in Kyuquot. That’s one of the biggest “holiday” features – not having to cook for yourself! Guests’ consistently rave about how well they're fed, with delicious meals inspired from all parts of the globe and variety that appeals to all palates. We're accustomed and prepared to make the menu work for your individual dietary needs and preferences. Q: I can't or don’t eat x, y or z – should I bring my own food? Your pre-trip questionnaire helps us to understand individual dietary requests. We regularly cook for gluten and lactose sensitivities, vegetarian preferences, and a myriad of other food allergies and sensitivities. We will do our best to accommodate dietary restrictions, but please be aware that we cannot guarantee that our food preparation areas and equipment are 100% allergen free. If you have any special dietary restrictions, or severe intolerances/allergies that restrict your menu options, please notify us well in advance, especially if you are interested in an Expedition Trip. The more specific you can be about your needs (and flexibility) the better we can work with you to ensure that you feel well fed. Sometimes, if you have very specific foods that work for you (snacks, certain brands, etc.) it is best to bring some of your own provisions and collaborate with our kitchen staff to weave these into our menu or dishes prepared specifically for you. Let’s have this conversation well in advance of your trip, to ensure we have it figured out. Q: Can I charge my camera battery? Yes! We want you to capture as many memories as possible on camera. The Wilderness Retreat is equipped with a communal camera charging station in the kitchen-gathering place. Q: What amenities does the "off-grid" Wilderness Retreat have? 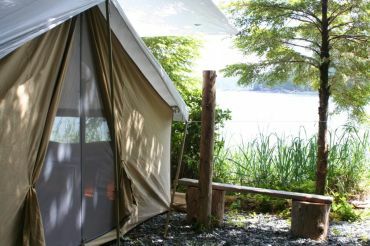 Despite being completely off the grid, our Spring Island Wilderness Retreat has all of your basic needs covered. The base camp is powered by solar panels and a small backup generator, which provide electricity for refrigeration and kitchen lighting, as well as an on-demand hot water shower system, so a hot shower is available! A wood stove can heat the kitchen dining shelter to provide a cozy place to relax and socialize, as well as an area to dry wet clothing. Each tent is equipped with a portable battery operated lantern, but we still recommend bringing a flashlight/headlight to find your way between the wash station, kitchen shelter, and your waterfront tent at night. Q: Is there WiFi - cell phone coverage? There is no cell phone service, or WiFi on Spring Island! Yes, you will be able to completely disconnect from outside world distractions, deeply connect to your environment, and leave feeling refreshed! This doesn't necessarily mean you can't have any access to the outside world, if you want or need it. Family/friends can contact you, in the case of an emergency (e.g., family illness). Our emergency contact information is included in your Pre-Trip Information package. Q: What gear do I need to bring – do you provide everything? You will receive a detailed packing list after you register. You need your own outdoor clothing appropriate for the west coast climate (described in the packing list), your own sleeping bag, and any desired alcoholic beverages. We otherwise provide all of the food, kayaking equipment and safety gear, including some paddling jackets and a limited selection of rubber boots for wading about in the shallows when examining intertidal life, or tromping through the enchanted rainforest during or after some wet weather. We have a few rental sleeping bags that can be reserved upon request. Expedition trip guests will also need to bring a tent, sleeping pad, and immersion protection (wetsuit or dry suit). We have some tents, and wetsuits that can be reserved for rental use upon request – this can be easier if travelling from afar or doing your expedition with us as part of a longer holiday adventure that otherwise doesn’t involve camping. Yes, traveling in by water taxi from Fair Harbour. We will need to ensure that the specific water taxi is suited to safely carry your kayak, and that your kayak is suited for use in our location, so please discuss this with us before planning to bring your own kayak. As paddlers, we completely understand and respect the desire to use what’s already familiar and comfortable – rigged exactly how you want it. With that said, our fleet is diverse – with enough early notice, we can often tailor our fleet to ensure we have a kayak model or size that you know works well for you. Chat with us to figure out what will be best. Q: When is the best time of the summer to go out there? The obvious answer is “when it best fits your schedule”. Knowing this question usually relates to weather we don't have a right answer for you. Some summers are dry – seriously, with drought-like conditions – from late June to early September. 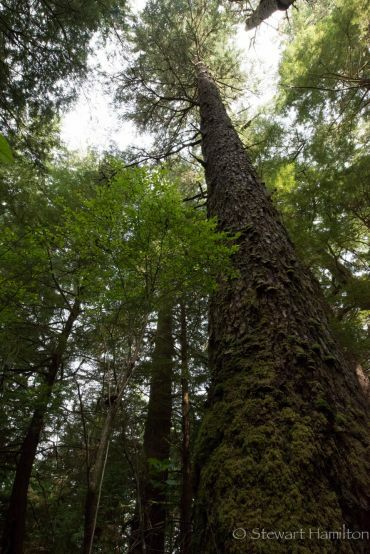 Other summers are more wet – Kyuquot receives the same annual precipitation as Tofino and Clayoquot Sound: 3.3 m of wetness - fortunately, most of this falls in the fall, winter and spring! We’ve had each week of the summer be calm and glorious, and each week as windy and wet - no week is every the same from one summer to the next. Our Wilderness Retreat base camp facilities, expedition equipment, and location are ideal for whatever the weather. Typically, each trip will have one day or night with some precipitation – we actually hope for this as it keeps our water supply topped up (for dishes and shower), quenches the thirsty forest, and keeps the fire hazards down. Sometimes, really sunny and dry periods can be very windy with large swell and wave conditions that reduce the scope of our paddling options. Meanwhile, overcast or foggy conditions can be “go anywhere” days…and you get less baked by the sun! West coast Kyuquot summers are generally mild with average temperatures of 19 C (66 F) to 25 C (77 F) during the day & cooling to as low as 8 C (48 F) during the evenings. Ocean temperatures are 9 C (50 F) to 13 C (58 F). Rainfall during the summer averages 83 mm (3.25”) in July and 93 mm (3.66”) in August. This amounts to less than 4 inches of rain per month. When it does rain, it tends to rain hard for a day then stop. Despite the “wet coast” reputation, summers are often dry and fire bans are possible. We sometimes collect so little rainfall that we must bring water to Spring Island by boat from the Village of Kyuquot for washing and showering. Join us when it fits your schedule - we’ll work with you and the weather to ensure you truly get away for an unforgettable world-class west coast adventure.